United Nations humanitarian agencies have begun to assist communities in southern Pakistan that have been pummelled by monsoon rains which have claimed the lives of almost 200 people and destroyed or damaged nearly one million homes in an area still recovering from last year''s catastrophic floods. An estimated 4.2 million acres of land have been inundated by floodwaters caused by torrential rains during the annual monsoon season, with Sindh province the hardest hit and Balochistan also badly affected. About 200,000 people are displaced from their homes and require immediate assistance. The Pakistani Government has called on the UN to support its own relief operations and a joint Pakistani-UN humanitarian team has visited some of the affected areas and met with local officials to discuss the disaster. The UN and Pakistan have begun a rapid needs assessment in Sindh, with shelter, food, water, sanitation, hygiene and health care expected to be the priorities. The UN Office for the Coordination of Humanitarian Affairs (OCHA), which said that overall needs remain "huge," reported that nutrition and promoting an early recovery in affected areas will also be key challenges. Timo Pakkala, the UN Humanitarian Coordinator in Pakistan, said that after "seeing first hand today the devastation and vast amount of flood water in Sindh, now is a crucial time to stand in solidarity with the people of Pakistan, and build on the lessons learned from the recent 2010 floods response to support the Government of Pakistan in their ongoing monsoon relief efforts." Last year''s floods killed some 2,000 people and submerged about a fifth of the country''s land, affecting 20 million people in total. 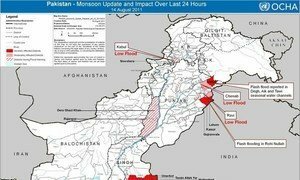 United Nations humanitarian agencies in Pakistan are on standby after sustained rains have reportedly affected up to 750,000 people in Punjab and Sindh provinces, killing up to 25 and displacing some 50,000 others.